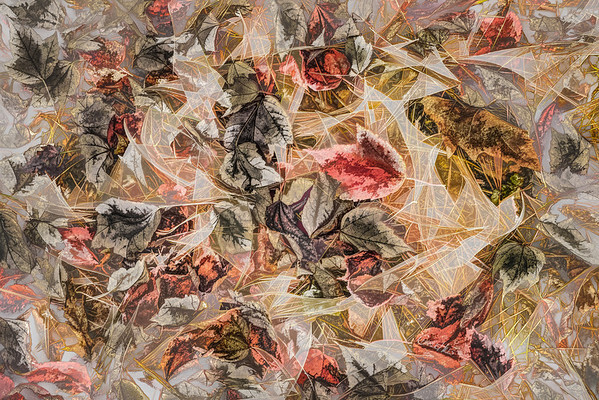 FALLEN LEAF STYLIZATIONS - The patterns made by leaves that have fallen to the ground in the fall have never been so interesting to me as during this project. The images were taken in November 2013 when the weather a few days before I took these caused a large number of still colorful leaves to fall all at once into huge piles on the streets near my home. In some of the images, pine needles, which had also fallen, are interspersed with the leaves. I wanted to render the images in a stylized way in post processing. I experimented with several variations and, in the end, decided that many of the variations might be of interest to designers, decorators, and home owners looking for a particular color palette, mood, and style. These images are examples of a larger library of images I have available. There are nine style variations included here and the first nine images are the same "photo" shown in each of the variations. After looking at the first nine, you may want to scan to other examples of the styles you are interested in. If you would like to see more, then use the Contact Menu and I'll send you a link to the full library.